Researchers at the Copenhagen University have undertaken a user-based online survey on marine outdoor recreation. The mapping will contribute to the inclusion of outdoor recreation interest areas in the upcoming Marine Spatial Planning being implemented in the EU. 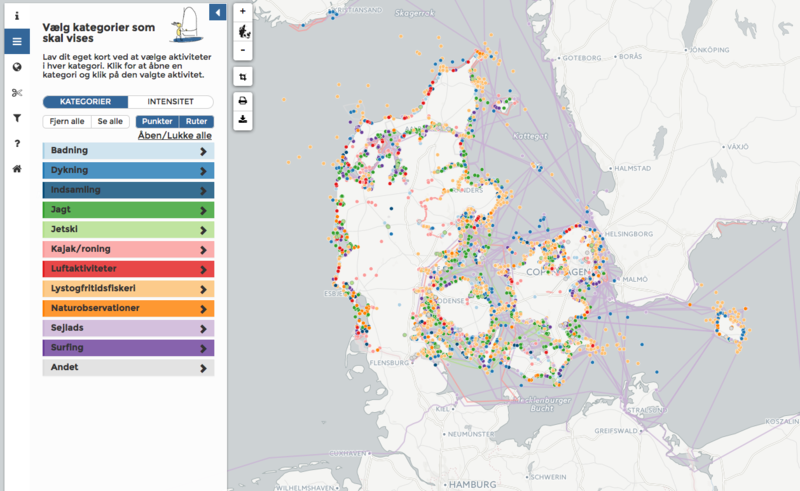 Where are outdoor recreation activities currently asking maritime space in Denmark? How can I develop an easy to use mapping tool to gather input from the public on maritime issues? Marine Spatial Planning is a new type of planning in Denmark that the EU is implementing in all member states due to the intensive and uncoordinated use of the sea and coastal areas in many places. Member States can select the sectors they want to include in the Marine Spatial Planning but the Directive have a list of suggested sectors including tourism. However, outdoor recreation is not on this list. In reality, only mapped sectors can be included in the MSP planning. Mapping the marine recreational activities and interest areas at sea, so this can be included in marine spatial planning. Detailed GIS-mapping of physical conditions and facilities in a comprehensive mapping of interest areas for marine recreation. The interactive map containing bottom up input from the respondents on recreational sites relevant for MSP. Input has lead to a report, focussing on the results from the first year (Danish only). Other reports will follow as new input will be gathered. The input gathered is shared with the project Vandfuglefriluftsliv about mapping touristic activities. This practice is highly transferable and can be applied for in other countries to gather bottom-up input on specific maritime issues or uses.